Cute light that I put at the top of my basement stairs where there was no light. Fit in a small space and looks really nice! 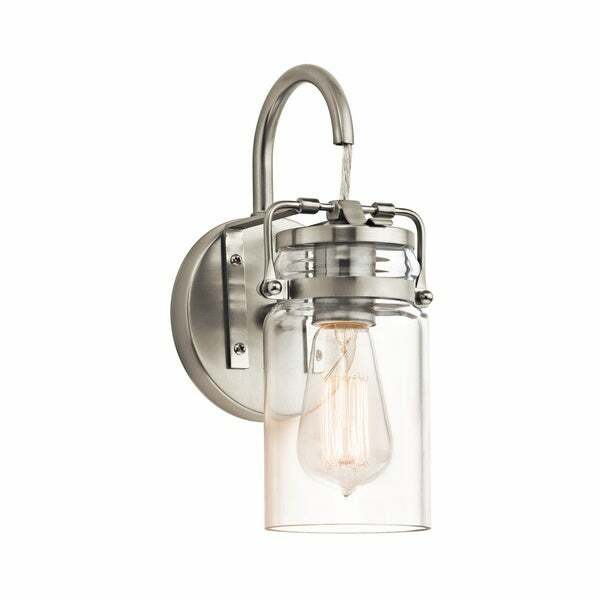 This Brinley collection 1-light wall sconce features a brushed nickel finish that will complement many urban, loft, and transitional decors. The familiarity of the canning jar glass shade adds interest and completes the look of this vintage design. Beautiful Brushed Nickel finish with a Clear "Canning Jar" Glass shade. Fixture Dimensions: 11.5 inches high x 5 inches wide x 6.25 inches deep. I was looking for something different to go on either side of my tv cabinet. Looks a little nautical but not too literal. They are shiny and clear, love the cord exposed, it makes it look crafted and much more expensive than it is. These are over the top awesome. Purchased for my bathroom post demo and redesign. They’re stylish, decorative and sleek without being too much. I hung them on either side of a very plain and sleek mirror and they are too cool. These lights are the kind of extra touches that make a good bathroom design a great one. They’re not clunky or large and they are very easy to put together and attach to the wall. Great design. These lights are in my bathroom and their simple design compliments the modern farmhouse design I was going for. We added some Edison bulbs to complete the look. No problems with installation. This is the prettiest light. For a single light it makes a huge statement. The reflection on the wall and ceiling are just a bonus. And it is plenty of light over our sink. 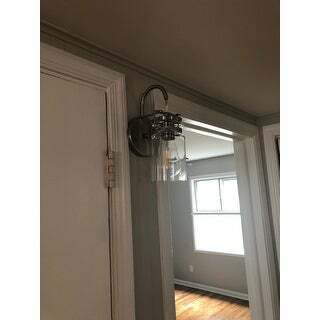 Beautiful fixture that instantly updated our hallway and fit into small space between two door frames (just under 5 inches). Shown in picture with LED bulb, did not come with. Beautiful fixtures, they arrived quickly and in perfect shape. They have not been installed yet, but will be a great accent in the new master bath. Beautiful light, just haven't installed yet! Looks exactly as pictured! Love this light fixture. Purchased it to hang in a dark hallway in an old home, so it is very period-appropriate. We used a 4 watt Edison bulb, and I really love the look! Very nice! This sconce is stunning, great quality! This is a cute light with style. I bought them for a hallway and they look great. Inexpensive hall light that borders madern and industrial feel. Just as described. It's well made. Super cute! It’s the perfect addition to our coastal bathroom. Product is exactly as described in the listing. Would purchase again without a doubt. I am very pleased with this purchase. The wall sconce looks just like in the picture and was was perfect for my home. I would definitely purchase again and probably will buy another. Thanks overstock for another great item. "Can this be used outdoors"
"is the cord adjustable? I would like to use these lights bedside but, my wiring is for higher wall sconces. would like to lengthen cord to bring closer to night stand." Mine are about 7 feet off the floor, I had an electrician put them in, so I can't tell you how much higher I could have gone.